Located in a canyon at the foot of the Mountain Heng in the province of Shanxi, and built in the later period of the Northen Wei Dynasty (368 - 534), the Hanging Temple hung in mid-air is a rare piece of architecture of its kind in China. It was listed as one of the 10 top architectural wonders of the world by the Time Magazine in Dec. 2010. The existing 400-hall/house/building/pavilions, all of wooden structure, are scattered around in different secluded spots or on steep cliffs between 26 and 50 meters from the bottom up. Constructed on mechanical principles, is stands propped up by hidden rocks corridor balustrades well connected together. Unique, difficult of access and ingeniously built, it is, as a local saying goes, hung by three horsetails suspending in the air. "Inside the temple are more than 80 bronze cast statues, iron cast statues, and clay sculptured statues and stone carvings banded down from different dynasties. 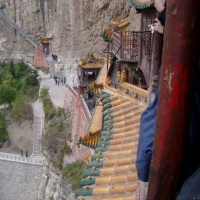 The Hanging Temple is also known as Hanging Monastery in the rest of the world. It features its Buddhist, Taoist, and Confucian elements. It is considered as the best place to explore the facts of Chinese religons. 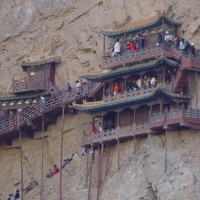 The temple is accessible by car from Datong (about 65 km), the closest city to the northwest. Along with the Yungang Buddhist Caves, the Hanging Temple is one of the main tourist attractions and historical sites in the Datong area.